Fellow lovers of the rock and roll memoir: It's a truly great time to be alive. Hot on the heels of Kim Gordon's Girl in a Band, Penguin Random House has announced that The Pretenders' Chrissie Hynde is working on "an incredibly frank" tell-all of her own. "Hynde will write about her childhood in Akron, Ohio, offer a 'strikingly intimate portrayal' of the punk rock scene of the 1970s and a 'bittersweet' look back at the Pretenders, who had such hits as 'Brass in Pocket' and 'Talk of the Town,' but lost two original band members to drug-related deaths," reports Page Six. The stories Hynde shares are sure to be exciting. 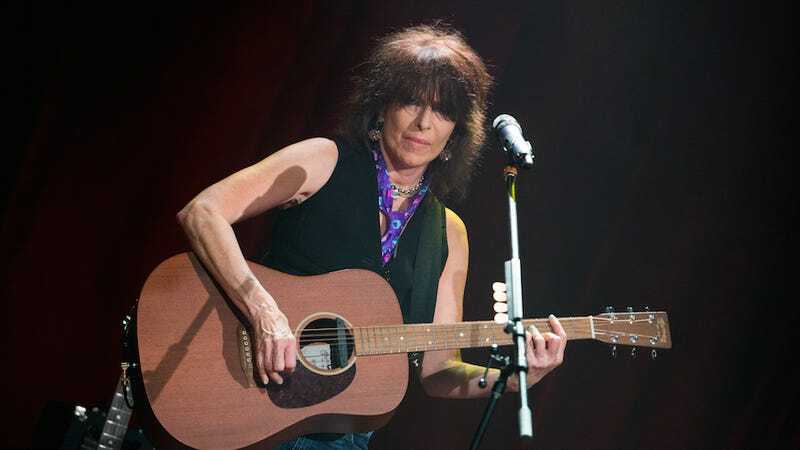 She was present at the Kent State shooting, almost married Sid Vicious (thankfully that fell through) to stay in England and continue performing with the Pretenders (both stories are told by Matt Pinfield in the cartoon Chrissie Hynde's Vicious Love). She had a kid with Ray Davies, married Simple Minds' Jim Kerr and—most important of all—formed the Pretenders and became one of the most well-respected musicians in rock. "Hynde, 63, said in a statement issued through her publisher that she hoped her book would make people dance, have fun, possibly cry and maybe reach for a guitar," continues the Page Six write-up.